What really made Broncos-Patriots an OT thriller? Plus, the rest of the notable news from Week 12. Can you believe that game? First, the stunning early lead. Then, the comeback, seemingly out of nowhere, like it was orchestrated all along. And then, after a fierce fight back, the huge turnover that led to a narrow victory. Man, that Texans-Jaguars game was fun. Oh, the Broncos-Patriots game? I guess we can talk about that, too. You should have seen Chad Henne during that ga— … no? OK. Um, let’s go through the big talking points from the Sunday-night game then. Before all the decision-making and the myth-destroying and the hand-warming, there were three fumbles that seemed to seal New England’s fate before the game even really took off. The Patriots fumbled on each of their first three possessions, with the Broncos recovering all three, returning one for the opening touchdown of the game. Denver came away with 17 points from those three takeaways, and when it added a third touchdown halfway through the second quarter, it led 24-0. Denver’s win expectancy would peak shortly thereafter, as it went into halftime with a 96 percent chance of winning, per Advanced NFL Stats. The reaction to those three fumbles was curious. The Patriots obviously couldn’t punish Tom Brady for fumbling amid a heavy rush, but Bill Belichick laid down the hammer on running backs Stevan Ridley and LeGarrette Blount, neither of whom played a snap after giving up the football. Obviously, Ridley has had fumbling problems recently; this was his fourth fumble of the year and his second consecutive game with a fumble. Last week, after he fumbled against Carolina, the Patriots benched him for several possessions before allowing him to return to the game. Honestly, I’m not sure what these benchings are really supposed to do beyond reinforce whatever doubts Ridley has circling around his brain right now. What is Ridley supposed to learn from the benchings? That he shouldn’t fumble again? Does he not know that already? If there’s a technique issue that’s causing Ridley to fumble, and that technique hasn’t been corrected, why is he in the game to begin with? And if it’s not a specific issue with something Ridley’s doing and just a commentary on the bad outcomes of those fumbles, what’s the point of basically grounding him? Do you bench him if he fumbles and the Patriots recover the fumble, as was the case with Julian Edelman on his first-half punt return? If Ridley is not your best option at running back, why is he starting the game to begin with? It just seems weird to basically put a guy into timeout because he did something wrong. The Patriots were obviously unlucky to start the first half; we know that teams will recover about half of the fumbles in their games, and so, naturally, losing three consecutive fumbles to start the game was pretty brutal. The Patriots then proceeded to go on a tear of fumble luck. They recovered Edelman’s muff and subsequent fumble on the same punt. Then, Brady came up with a loose ball before completing a pass to Brandon Bolden. The Patriots then nabbed a muffed punt by Trindon Holliday just before halftime, leaving them with four recoveries in seven. By the end of the first half, the Patriots weren’t “unlucky,” but the Broncos were able to get much more out of their fumble recoveries than the Patriots did from theirs. That obviously changed during the second half. The Patriots turned the game around with much-improved execution on offense and a series of forced turnovers. A Montee Ball fumble derailed the Broncos on their opening possession of the second half, with the Patriots recovering on the Denver 32-yard line and scoring six plays later. (Ball, who had averaged 7.3 yards on his first nine touches, also wouldn’t touch the ball again.) After another Patriots touchdown, an ugly Peyton Manning interception gave New England the ball on the Denver 30-yard line and the lead three plays later. The turnovers finally came back in a dramatic way at the end of overtime, when the Broncos’ move to make things “safe” ironically came back to bite them. Denver replaced a shaky-looking Holliday with the more reliable Wes Welker on punt returns, but with New England punting the ball away after what seemed like its final meaningful possession of the night with 3:01 to go, Welker’s late decision to call for a fair catch kept blocker Tony Carter1 out in front of the ball, which landed and bounced off him, with the Patriots recovering to set up their game-winning field goal. After their disastrous start, the Patriots recovered six of the final eight fumbles of the game. Just as the early takeaways allowed Denver to get out to a huge lead without having to do very much on offense, the fumble recoveries thereafter from New England fueled its unlikely comeback and then helped pull a win out of what appeared to be a situation where the best case would be a tie. The entire path of this game hinged upon fumble recoveries. It’s everybody’s favorite topic! The Patriots’ impressive comeback arose from a dominant third quarter, one that saw New England score touchdowns on each of its three possessions while holding the Broncos to a fumble, an interception (in the fourth quarter, but on a drive that started in the third), and a 22-yard drive ending in a punt. Given that there was a steady stream of (presumably Patriots) fans leaving at halftime, it’s pretty easy to make a case that the Patriots captured and then rode the tidal wave of momentum to their second-half comeback. Allow me to posit that there might be tangible, on-field reasons why these teams played significantly better or worse during different moments of this game. I already mentioned the turnovers, but the natural follow-up from that is the massive impact that field position had on this game. Denver’s first-quarter scoring drives were on the fumble return and from the Patriots 10-yard line and 44-yard line. It added a touchdown on a drive that started from its own 30-yard line. New England’s seven drives in the first half all began inside its own 30-yard line before the Holliday muff that set up the half-ending Hail Mary. Of its five consecutive scoring drives to start the second half, three started in Denver territory and a fourth began on the New England 35-yard line. The Carter fumble in overtime also produced a drive that began deep inside Denver territory. Otherwise, there were 20 drives that began inside each team’s respective 30-yard line, and those drives produced a total of two touchdowns. In-game injuries also dramatically affected this contest. Although the aforementioned Hail Mary came up eight yards short of the end zone, in an attempt to make a play on the ball, Broncos cornerback Dominique Rodgers-Cromartie suffered an injury that knocked him out of the game, a move that left Denver without its two top cornerbacks (with Champ Bailey inactive). Defensive tackle Kevin Vickerson, who had a mammoth first half, left before halftime with a hip injury. Knowshon Moreno, who played brilliantly (against a Patriots defense without its top two defensive tackles), had to limp off at times throughout the game, forcing the Broncos to use Ball and undrafted free agent C.J. Anderson, each of whom fumbled.3 They also were without starting safety Duke Ihenacho for a bit. On the other side, the Patriots lost fill-in right tackle Marcus Cannon to an early ankle injury and had to replace him with Will Svitek; both Svitek and star left tackle Nate Solder struggled mightily during the first half before settling down and playing much better during New England’s second-half comeback. Aqib Talib, who delivered an excellent riposte to his disappointing return performance against Steve Smith a week ago, missed a few key plays late in the contest. The Patriots also went without Ridley and Blount for much of the game, although that was by choice. There are also the little things that destroy the momentum arguments but get lost the further each play fades from memory. How the Patriots were moving the ball well during the first half before the two fumbles from their backs. How the refs found an unlikely offensive pass interference call on Danny Amendola at the end of the first half and missed a far more brutal penalty to free Rob Gronkowski early in the third quarter. How Brady nearly threw one obvious interception when New England had all the momentum in the second half. How Manning’s brilliant drive in the fourth quarter began with an ugly interception that was called back on a holding penalty that didn’t seem to be directly affecting the play. Those things don’t fit the overly broad momentum shifts we slap on a game, because they get overruled by things out of their control. If you want to believe momentum propelled the Broncos into the lead, disappeared, went with the Patriots, disappeared again, and then waited around for a while before suddenly popping back in New England’s favor, go nuts. I’m sticking with the stuff that actually happened on the field. Did Peyton Manning have a disappointing game? And was it because of the frigid New England weather? I’m going with sorta and probably not. Manning’s numbers — 19-of-36 for 150 yards, two touchdowns, one interception — are unquestionably pedestrian. No arguing that. Of course, there’s context that also needs to be applied to any set of quarterback statistics. Manning was playing the vast majority of this game with a lead, meaning he spent most of his time handing off and passing only in obvious situations. That naturally depresses a quarterback’s numbers, and the Denver running game was incredible: The Broncos ran the ball 48 times for a whopping 280 yards. When he did throw, the Patriots were able to get consistent pressure on Manning, as left tackle Chris Clark had a truly disappointing performance after his great work against the Chiefs a week ago. When he needed to come up with a game-tying score, Manning delivered the drive of the night from either team, with a number of throws fit into minuscule windows or delivered on a surprisingly tight rope. That drive even included two consecutive drops from his receivers, who collectively didn’t have a great night, either. Demaryius Thomas couldn’t escape Talib, Eric Decker was anonymous, and Welker was essentially a non-factor as a wideout in his return to Foxborough, dropping one pass and having another knocked out of his hands. It doesn’t excuse Manning’s performance, but it qualifies some of the critiques. You can see Manning’s performance as split into 20-degree buckets for yourself here. His numbers look dramatically better if you include his other rate statistics and those games played with a starting temperature between 33 and 40 degrees, which isn’t exactly balmy. It’s a smaller sample, but none of his statistics suggest there’s anything specific about Manning’s performance in colder games that stands out as a sign of his weakness there. It’s also true that just about every quarterback plays a little worse in cold weather than in warm weather,4 so we would expect Manning to be a bit worse. Unless you think there’s a meaningful difference in terms of Manning’s ability to throw the football between 30 degrees and 35 degrees, the evidence suggesting Manning folds in cold weather is flimsy. If Manning had a bad game Sunday, it was because he had a bad game, not because he can’t handle the cold. Belichick has the gravitas and respect to get away with a lot of stuff that other coaches wouldn’t be able to fade. If, say, Dennis Allen had been the guy taking the wind before overtime yesterday and he lost, he would have never lived it down. But was it the right call? For last night’s outcome, it was. The Broncos didn’t score on their opening possession and couldn’t attempt a long field goal into the wind in the overtime period, forcing them to punt to New England for 22 yards that came off the ledger on the next play. What Belichick is making here is, like anything, a risk-reward proposition. Under the current rules, he runs the risk that the Broncos will score a touchdown on the opening drive and win without ever giving New England the ball. Given that his kicker is almost surely going to produce a touchback with the wind on his side to start overtime, that means the Broncos would have to drive from their own 20-yard line to produce that touchdown. Given the lack of success each team had in producing long drives during that game, it seems reasonable to think their odds of doing so are not ridiculously high. The primary reward is dramatically lowering Denver kicker Matt Prater’s range while expanding Stephen Gostkowski’s range for possible field goals. You’re likely forcing Denver to pick up 10 yards and an additional first down to get into Prater’s range, while your efforts to get into Gostkowski’s range are now 10 yards easier to come by. The Patriots are also likely to receive shorter punts from the Broncos by virtue of punting into the wind, which should pick up several yards of field position for them on each drive in overtime. Is that trade worth it? Meh. Although the Broncos hadn’t been playing very well on offense, they’re also the league leaders at scoring touchdowns. Before Sunday, they had scored touchdowns on 38.5 percent of their offensive possessions, the best rate in the league by a significant margin. The next best team was the Saints, at a lowly 30 percent. (OK, not lowly.) Even if you don’t think that number is Denver’s “true” touchdown rate in the specific context of this game against these Patriots in overtime, they’re really good at scoring touchdowns. The smaller gains Belichick was chasing — 10 yards here and there — add up over time, but there’s no guarantee you’ll get more than a possession for it to actually matter. It’s difficult to quantify because there are so many moving parts, but my suspicion is that Belichick traded a dollar for 90 cents worth of change. In any case, I don’t think it was clearly a good move or a bad one, just uncommon. So, what did this game tell us about these two teams? I’m not sure that we know an awful lot more than we did before this game began, mainly because the game was so heavily marred by the early turnovers and how they dramatically affected the context of the game. People who doubted that the Patriots still had a dominant passing attack now have the 55-point outburst against the Steelers and this pass-fueled comeback win as a sign that the Patriots can throw the ball as well as anybody in football when Gronkowski and Shane Vereen are healthy, and that was with little from nominal starting wideouts Aaron Dobson (zero targets) and Amendola (three catches, 17 yards). We know their running back situation is basically in flux; Ridley could come back next week as the starter or be the third-stringer for another month. The Broncos put together one of the best running-game performances in Manning’s career, which tells you something about both how bad the New England interior is and how good the Broncos can be when they need to run. We also saw how exposed the backups in their secondary can be when the pass rush doesn’t get home. It’s also easy to imagine Denver getting contributions from the missing Julius Thomas, who would have been a matchup nightmare for a Pats team without Jerod Mayo. Their loss reopens the AFC West, which appeared to be closing shut when it seemed like the Broncos would win after the Chiefs lost for a second consecutive week. Now, if the Chiefs can beat the Broncos in Arrowhead next week, they would have a one-game lead in the West with games against Washington, Oakland, Indy, and San Diego to come. Denver has what seems to be an easier schedule — Tennessee, San Diego, Houston, and Oakland — but, well, let’s talk about the AFC. Doesn’t anybody want to make the playoffs in the AFC? New England and Indianapolis appear to be locks to win their respective divisions, Denver and Kansas City will go in one way or another, and Cincinnati still appears to be the cream of the AFC North crop. That’s five teams. That sixth spot? Saying it’s up for grabs would be generous. It’s up for even the tiniest bit of attention from anybody. It’s throwing itself at the league and the league is telling it to go home and sober up. That’s where we’re at for that sixth spot in the AFC. Basically, every insane thing that could have happened yesterday to turn that race into a disaster happened. The Titans beat the Raiders in the final 30 seconds, only hours after the Chargers came back and upset the Chiefs in an unlikely shootout. Baltimore stomped the Jets, and Pittsburgh knocked Jason Campbell and the Browns out of the hunt. Miami fleshed out the picture by blowing a fourth-quarter lead to Carolina. That’s six teams. They’re all 5-6. And one of them is likely going to be the wild-card winner in the AFC and play the Patriots or Bengals as double-digit road underdogs in Round 1. Why They’ll Win: All the tiebreakers belong to them. Tennessee has already beaten the Steelers, Chargers, and Jets, which would give them the sixth spot over any of those teams if they have the same record at the end of the campaign. They have narrow losses to the Seahawks and Colts on their résumé. Their offensive line should get better as the season goes along, which would theoretically create holes for Chris Johnson and wake up a dormant running game. Why They’ll Fail: They’re in this race only until their schedule gets tough, and that starts right now: They are at Indianapolis and Denver over the next two weeks before hosting the suddenly scary Cardinals. They finish with games at Jacksonville and against Houston, but they’re probably going to be 5-9 heading into those games. Four of their five wins are by a touchdown or less. They lost to the Jaguars. At home. Why They’ll Win: They have an easy schedule that includes three home games against Miami, Cleveland, and Cincinnati. Their defense has secretly gotten better. 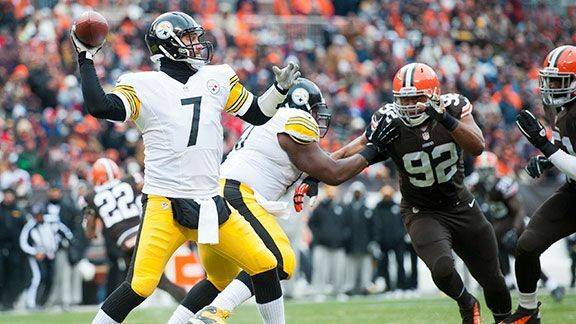 David DeCastro is suddenly the road-clearing guard the Steelers hoped he would be when they drafted him in the first round of the 2012 draft. They’ve got the best quarterback of the group, and unlike most years, Ben Roethlisberger is actually sorta healthy (by his sore standards). They were 18th in DVOA heading into the week, making them the second-best team in this group. Why They’ll Fail: Their road trips are to Baltimore for a suddenly huge game on Thursday night and to Green Bay for a Week 16 matchup that will likely involve Aaron Rodgers. They have no obvious pass-rusher with LaMarr Woodley injured. They likely need to win at Baltimore to stay in the hunt. They probably ran out of Steelers-Ravens voodoo a few years ago. They already have the whole ceremonial sacrifice of Todd Haley thing planned and don’t want to lose their deposit. Why They’ll Win: Baltimore always seems to pull out games like this with Joe Flacco at the helm. Flacco’s Ravens take on the aging Steelers in what could be an eliminator in Baltimore on short rest. Their offense can’t possibly be as bad as it has been running the football, and Flacco can’t throw that many picks over the course of the season. The defense, which lost Ray Lewis and Ed Reed in the offseason, is getting better as the season goes along. Does it sound like I’m trying to talk myself into this? Why They’ll Fail: They have the most brutal schedule of the teams on this list. After hosting the Steelers and Vikings, they go to Detroit, host New England, and then travel to Cincinnati in Week 17. They need to sweep their next two games to have some hope of success. Also, the ray of light from the running game against the Bears last week was followed up by another Trent Richardson–esque performance by Ray Rice on Sunday. Why They’ll Win: They just picked up the most impressive win any of these teams have had all year, a 41-38 victory over the Chiefs that they pulled out with a Philip Rivers one-minute drill. Rivers isn’t the best quarterback on this list — you’d probably take Roethlisberger — but he’s currently playing the best of any of these passers, even though he needed to throw Sunday’s game-winning pass to Seyi Ajirotutu. Among this group, they were the top-rated team according to DVOA heading into this week, and considering that they beat a top team in Kansas City, the Chargers will continue to rise there. Why They’ll Fail: They could be in the catbird seat if they had not lost close games to the Texans and Dolphins. Their upcoming schedule includes the Bengals, Broncos, and Chiefs. San Diego’s pass rush is virtually nonexistent, and if the Chargers don’t get a rush, their limited secondary looks downright brutal. San Diego can win a shootout with anybody and lose a close game to just about anybody, too. Why They’ll Win: This wouldn’t exactly be the first time Rex Ryan hustled his way into an unlikely playoff berth at the end of the season; he managed to pull it off against Colts and Bengals teams with nothing to play for during his first year with the team, and that was enough to take a seriously flawed team all the way to the AFC Championship Game. They have a legitimately above-average defense and a running game worth a damn when the offensive linemen are playing well, which is more than most of the teams above can say. Why They’ll Fail: They’re stuck with Geno Smith as their quarterback for the time being, which isn’t healthy. Ryan is considering a move to Matt Simms, which is like returning rotten food and specifically asking for different rotten food in return. They routinely committ penalties like failing to clear a lane for the referee to follow a punt return, as they did on Sunday. They have a gruesome minus-101 point differential, suggesting they’re roughly a 3-8 team masquerading as a 5-6 unit. Why They’ll Win: They’re the most talented team of these six. They have a viable passing attack with talented receivers and an excellent pass rush. They have a friendly schedule to come, with two games against the Jets to go along with the Steelers, Bills, and Patriots. They could theoretically be motivated by people expecting them to fall apart after the Richie Incognito saga, as absurd as that sounds. Joe Philbin is possibly coaching to keep his job. Why They’ll Fail: Teams are built from the lines out and Miami has, after the suspension to Incognito and the departure of Jonathan Martin, probably the worst offensive line in the league. Three of those five games are on the road. They’re well behind on tiebreakers and really need to sweep the Jets to come up with a serious hope of winning the wild-card berth. It would help if they could run the ball or, noticeably, stop the run whatsoever. They may be busy mourning Jeff Ireland’s impending departure from the team. The only true outsider I’d throw into the mix here is Buffalo, which will have EJ Manuel healthier coming off of this week’s bye and the league’s easiest schedule going forward: Buffalo hosts the Falcons and Dolphins while traveling to Tampa Bay, Jacksonville, and New England in a possible Week 17 matchup between a desperate team and one with no competitive interest in suiting up. You know how those go. At 4-7, the Bills would likely need to win out. If I had to pick a winner … I would take the winner of this week’s Steelers-Ravens game on Thanksgiving night, a game that suddenly seems to be meaningful after feeling like it wouldn’t matter for most of this season. I suspect the Steelers win that game and claim the sixth seed in the AFC. Please allow me to add to the record that they should not be proud if they make it there. Because of the short Thanksgiving week, I’m doing an abbreviated TYFNC in today’s column as opposed to a full-length one tomorrow. I know this is the second week in a row without the typical TYFNC, but don’t fret: TYFNC will be back to its normal length and style next week. The Good: The move of the week belonged to — who else — Riverboat Ron Rivera. With his Panthers trailing 16-13 and the Dolphins holding on to the football with 4:39 left, Rivera used his timeouts to try to get the ball back. A second-and-15 checkdown on the Miami side of the field kept the clock running, but Rivera realized that the move set up a third-and-11, which would likely result in an opportunity to get the ball back in two plays. He used his first timeout, and when Miami checked down again on third-and-11, he used his second timeout to get the ball back with 4:20 left. If he had saved his timeouts, Rivera would have gotten the ball back instead with about 3:00 to go. Then, he played to win now as opposed to putting off losing until later. His team ended up in a desperate situation, with fourth-and-10 on their own 20-yard line with 2:33 left and that lone timeout to go. Rivera could have punted and, assuming Miami ran the ball three times, gotten the ball back with about 1:15 to go. Instead, Rivera chose to go for it, knowing that if he failed, the Dolphins would likely settle for a field goal and still leave Carolina with a kick return and a chance to win with a touchdown. As it turned out, he didn’t need to worry about failing; Cam Newton hit Steve Smith on a dig route for a first down, the Panthers marched down the field (with help from a personal foul), and Newton eventually found an open Greg Olsen in the end zone for a game-winning touchdown pass. Rivera didn’t even need his final timeout. Honorable mention goes to the Jaguars, who went for it on fourth-and-goal from the 1-yard line on their opening drive against Houston, scoring a touchdown to go up 7-0. That ended up being the only touchdown of the game, as the Texans kicked two short field goals. Even better (if you want to apply the #takethepoints logic), because Jacksonville didn’t take the points, Houston’s final drive inside two minutes needed to produce a touchdown as opposed to a game-tying field goal. That led to an interception on the edge of field goal range and a Jags victory. The Bad: This goes to Mike Smith’s decision to kick on fourth-and-15 against the Saints late in Atlanta’s 17-13 loss to New Orleans on Thursday night. With three timeouts and the two-minute warning left, Smith passed on a chance to go for it on fourth-and-15 to attempt a 52-yard field goal with kicker Matt Bryant, who promptly missed his kick (with a Sean Payton icing involved). As is custom when playing for a future possession on fourth down late in a close game, when the Falcons got the ball back with five seconds left, they had to attempt to score on a much more difficult conversion, here one play from 62 yards out. It didn’t work. To keep things simple, you’re weighing two sides here. Side 1 is the probability that you will succeed on fourth-and-15 and then drive from the Saints’ 20-yard line to score a game-winning touchdown with your four chances to stop the clock along the way. Not a fun option. But compare that to Side 2, where you’ll need to hit a 52-yard field goal, stop Drew Brees from picking up one first down (or attempt an expected onside kick yourself, which has even worse odds), grab a punt, and then drive however many yards you need again to set yourself up for another field goal, this time to win the game. If you’re the Jets, maybe Side 2 beats out Side 1. Maybe. If you’re the Falcons? There’s just no way. A 52-yard field goal is hard enough as it is, and sure enough, Bryant stopped Smith’s plan in its tracks. 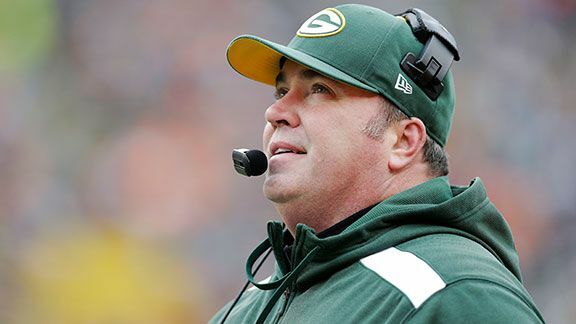 The Curious: Mike McCarthy curiously decided to kick a field goal on the opening possession of overtime during Sunday’s Packers-Vikings tie. McCarthy’s team was facing a fourth-and-goal from the 2-yard line with an opportunity to seal the game by scoring a touchdown on the first drive of overtime. Instead, he kicked a 20-yard field goal, and after the Vikings responded with a field goal of their own, the two sides sleepwalked through the remainder of overtime for an unsatisfying tie. Should McCarthy have gone for it? I was going to prepare an explanation, but right before I put that together, ESPN Stats & Information sent over a nice explanation of the decision using its win probability model. It estimates that the Packers would have had a 45 percent chance of succeeding on fourth-and-goal from the 2-yard line, based on the historical success rate from there since 2001. If that number was an accurate representation of Green Bay’s chances, its shot of winning by attempting a conversion was at a robust 82 percent. Part of that is because the game is far from over if the Packers fail; the Vikings would still have been pinned on their 2-yard line with Christian Ponder at quarterback, which isn’t exactly an envious position. If they had failed on the conversion, ESPN Stats & Info estimates that the Packers would still have had a 67 percent chance of winning the game. By kicking the field goal and subsequently kicking off to Cordarrelle Patterson (who returned it to the 20-yard line), Green Bay’s chances of winning were 71 percent; the field goal made only a modest bump in their chances of winning. Coaches are still adjusting to the new overtime rules, and it’s easy to apply hindsight to a tough decision like McCarthy’s. But given the expected conversion rates, it’s pretty clear he should have tried to win the game while he had the chance from the 2-yard line. Grantland contributor/Denver Post writer Joan Niesen noted on Twitter after the game that Carter hadn’t played on special teams since before Week 3 and had recently suited up for just one defensive snap against the Chargers. Remember last year’s dramatic comeback by the Patriots against San Francisco? That was the one where New England came back from 31-3 down in the third quarter to score four consecutive touchdowns and tie the game in front of a raucous crowd at home. And then, with all the momentum, the Patriots … allowed LaMichael James to return the ensuing kickoff for 62 yards before Colin Kaepernick threw a 38-yard touchdown pass to Michael Crabtree on the next play from scrimmage to give the 49ers a 38-31 lead that held up as the margin of victory in the 41-34 game. One of the tricks that gets used here is that quarterbacks who “can’t handle the cold” like Manning often only have statistics for road games show up in their cold-weather splits, because they rarely play any home games in cold weather. There are reportedly studies suggesting that Mornhinweg was right, although I don’t recall seeing said studies.